At first glance, these lines seem to affirm the beautiful complexities of young learners, and the many capabilities for self-expression they possess. In the PYP context, we may extend this interpretation by reading these words as a powerful reminder of our responsibility to provide creative, dynamic and layered experiences for our students that enable their thoughts to shine in their best light. Our key concepts were form, connection and responsibility. Coming into summer, our local environment was in full bloom with colourful flowers all around us, tall leafy trees shading us from the sun and soft green grass beneath our feet. Caring for plants emerged as a huge area of interest for my students. We had a purpose, born straight from our investigation in how we may care for living things. In order to grow a plant in our homes, it needed a durable plant pot to grow in. “Where should we start?” I wondered aloud. But the children were already a few steps ahead. One little group began drawing fierce scribbles and circular shapes using black crayon on white paper. Another little boy, below, headed straight for the shaving foam. “I need to draw it with my finger, not with a paper” he explained. 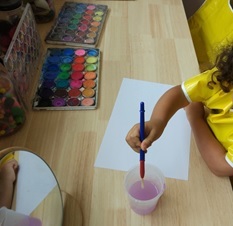 One little girl headed straight for the watercolours. “I need to think in colours” she explained. She sat and thought for quite some time. 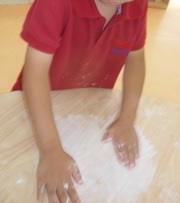 Another group of students decided to mix cornflour with water and oil to see if a “dough” could be made to make a pot. This group worked hard but could not get their dough to hold its shape. After two days of exploring, I brought out some clay. The children were invited to represent their thinking with their hands if they wished. 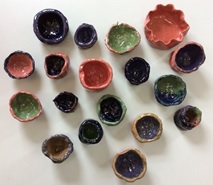 The kneading and pinching of the clay pots was a sensory feast, and the children had free reign to choose the style, shape and colour of their plant pot. We linked in with our art department in an authentic transdisciplinary moment, and in their support of our project, they made their kiln available to us. We learned all about glazes that strengthen clay pots, how many coats to apply, and how the heat of the kiln gives clay strength. Our final pieces were “shiny and hard and beautiful and strong” shared one student. This learning, from that first observation to the many beautiful drawings, sketches, etchings and paintings that followed, was a gentle reminder of the importance of listening and trusting in the instincts of my learners. Perhaps, in the greater scheme of things, this may serve as a reminder of our duty as teachers to follow, unafraid, down the shining and gloriously unpredictable paths of inquiry that our students illuminate to us. 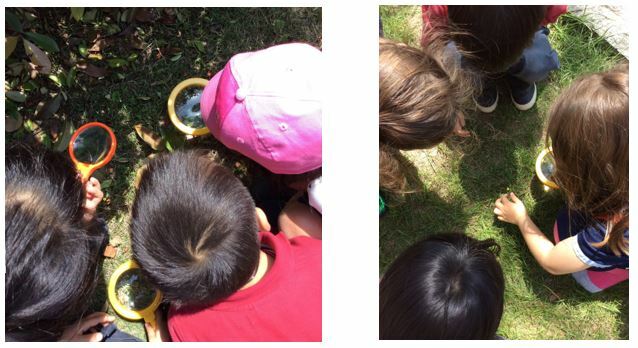 My pre-kindergarteners were excited to bring their very own plant pots home, along with a little pack of seeds, so they could continue their explorations over the summer break. Inquiry brings us to places full of wonder and inspiration. With so many languages to explore, so many learning pathways stretching tantalizingly ahead of us, the possibilities are infinite. Niamh Price is a Pre-Kindergarten teacher at Suzhou-Singapore International School, China. She is in her 7th year at this school. Prior to this, Niamh enjoyed teaching and working with children and families in different areas of Dublin, Ireland. 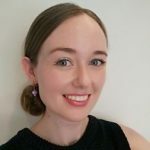 Niamh holds a Master’s degree in Drama in Education, with a research specialization in play and creativity in the early years classroom. She believes in the importance of establishing relationships with every student who crosses the threshold of her classroom, and is committed to finding out not just what each child can do, but who they are. Creating environments that invite beauty, curiosity and collaboration is an essential feature of her practice.